The group was established in early 1997 and commenced business with the distribution of Termiticide produced and marketed in the Government sector. Simultaneously pre as well as post Construction Anti-Termite treatment services were also commenced. Safe Havens was officially appointed as the Government's distributor, in a very short period of time, in 1997. The setup continued to expand its operation and a Multinational Company also appointed Safe Havens as their Sole Distributors for their product. In the year 2004, we start import and Marketing of a highly effective Termiticide under the brand name of “Protect FN”, containing a novel active ingredient “Fipronil”. Safe Havens is manned by a qualified and experienced Entomologist plus Supervisors and Personnel who have been in the ever growing field of termite control services for a considerable period. Safe Havens take pride in being “Front Line Professional” who have served a long list of satisfied client. The Termiticide used & marketed by us are research products and generally carry a warranty. To continuously improve our services and meet our customers' needs and requirements with professionalism, competence, high quality services and dependability. To maintain our reputation for delivering our services with total concern for public health and environmental safety. We envision Safe Havens Enterprises to achieve favorable customer satisfaction and earn recognition as one of the leading household pest controllers in the country. Total commitment to serving our customers by providing highly skilled and dedicated people, continuing growth for the company, security for its employees. Protect contains Fipronil, a revolutionary new, non-repellent or undetectable chemical technology. Fipronil has a different mode of action than any common insecticides. It is “an extremely active molecule”. In insects, it disrupts the nerves in the brain and spinal cord by interfering with the ability of these nerve cells to transmit nerve impulses. The result is uncontrolled activity leading to death of the insect. Protect is non repellent to termites, so the termites exposed to lower concentrates of Protect do not detect the chemical and will not try to avoid it. Therefore the termites will continue to forge through the affected soil unaware that they have been affected and that their days are numbered. As termites are social creatures and live in colonies, when affected termites, return to the colony they share the infection around, other termites then become affected and then are doomed. Through this unique “ Transfer Effect” the chemical can cause some of the nest to be killed off or in some cases the entire nest. 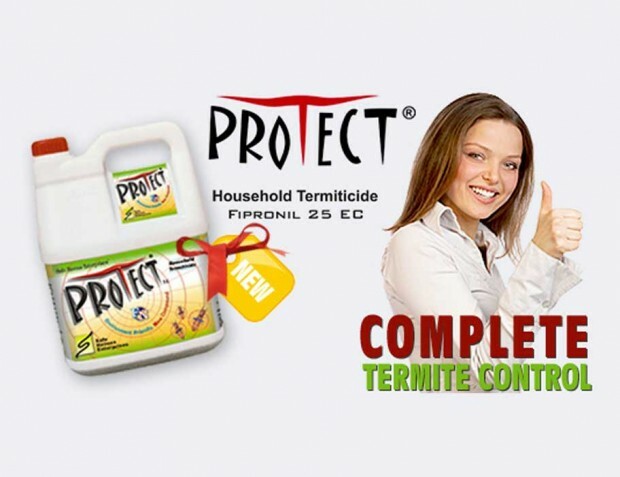 Protect is one of the most tested termite chemicals in the market. Protect is a safe chemical. Once it has dried and bounded with the soil, it has no odour, and is water based. In numerous trials around the world, Fipronil has consistently proven itself to be 100% effective in eradicating termites in three months or less, a level of efficacy that no other termite control system of any type has ever achieved, and Protect is proving to be equally effective in keeping termites from coming back. Ongoing field trials by the U.S. Department of Agriculture shows no sign of reinfestation at all study sites more than nine years after treatment with Fipronil-results no other termite control product can match. Since Fipronil went on the market in March 2000, Fironil certified professionals have treated more than 1 million U.S. houses infested with termites and been rewarded with remarkable results for their customers and their business.